Zip Tie Wall Mounts | Cable Tie Wall Mounts | Cal Fasteners, Inc.
Cal Fasteners stocks time-saving wall mounts that make it fast and easy to mount bundled wires, cables, hoses, and the like on walls and other vertical surfaces. Special stay-in-place tabs keep cable tie heads from sliding behind the bundle and help maintain correct placement. 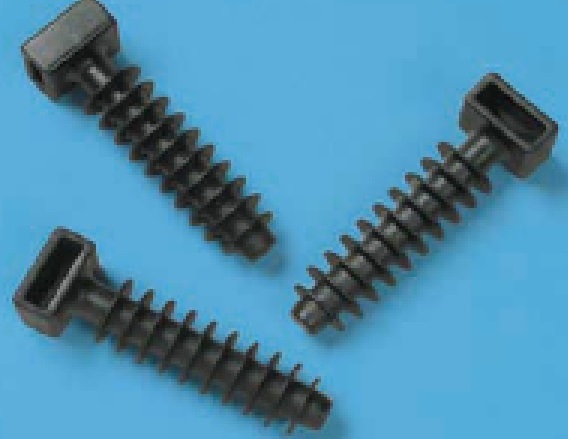 A unique one-piece design reduces time and cost by allowing for quicker mounting without the need for mechanical fasteners. Manufactured from durable black nylon for years of reliable use. ROHS compliant. Request a quote on wall mounts, or contact Cal Fasteners to learn more.